Ocean Beach Sunset No. 3 Cross Stitch pattern PDF - Instant Download! 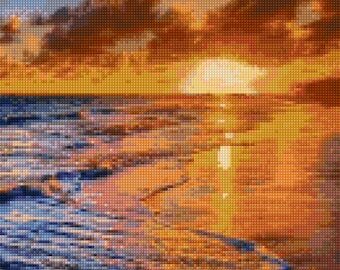 Ocean Beach Sunset Cross Stitch pattern PDF - Instant Download! Ocean Beach Sunset No. 2 Cross Stitch pattern PDF - Instant Download! Ocean cross stitch pattern, Stormy sky over waves, Cloudy sky over sea, waves crashing seascape, Beach landscape, PDF download. 11"x14"
Ocean Storm Cross Stitch pattern PDF - Instant Download!